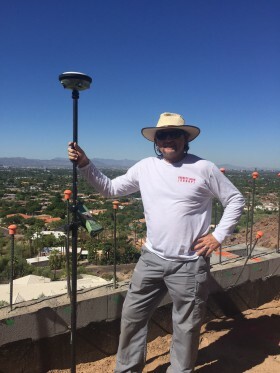 Jim Loftis has worked with developers of all sizes, from large construction staking projects, engineered site plans and surveys. We can work seamlessly with your company as a part of the team or independently. You can rest easy knowing that your client is in trusted and capable hands. We treat every job with dedication and professionalism and will always treat your client as our client. In addition, the Everett Alan Group are also capable of scanning and recording all of your documents in-house. This not only saves valuable time but reduces errors due to recording and ensures that your documents on record are of the highest quality possible which can further reduce errors down the road due to poor document quality. This can save a lot of time and ensures your documents are recorded quickly and accurately. The Everett Alan Group is a trusted source for recording documents with the town of Cave Creek, AZ. A Flood Elevation Certificate is a document generated by an engineer, surveyor, or qualified person that will provide data to help properly rate properties for flood insurance. An Elevation Certificate can determine where precisely your home is located in relationship to the Base Flood Elevation. You may want to obtain a flood certificate if your property is in a flood zone, and you are considering disputing it. This survey provides everything that an As-built survey does, but also addresses the title commitment of the property. The major difference between this and an As-built survey is the location of easements and other Schedule B items that show up in the title commitment. An ALTA/ACSM survey is usually only required if the property is being sold, purchased or re-financed. The acronym stands for American Land Title Association and American Congress on Surveying and Mapping. These bodies have outlined the requirements and also provide additional options (Table \’A\’) for these type of surveys. Topographical Site Surveys involve the collection of data relating to 3-Dimensional position; Spot heights, contours, significant vegetation and physical features are usually collected. Construction Staking provides the horizontal and vertical location of buildings, roads, utility lines, plantings, and site grading for new construction. A Boundary Survey will locate existing property corner monuments and replace those that are missing. Also a map will be produced and recorded with the county. Lot surveys are generally performed on vacant property prior to construction of improvements, or to establish fence lines, or to mark property lines prior to a sale. The purpose of a lot split is to take one larger piece of land and split it into smaller pieces. The frequency of which a lot can be split varies. The determination is generally made by referring to certain zoning restrictions in the area. We suggest to all land owners interested in a lot split, to familiarize themselves with zoning regulations in the area as well as referencing any Covenant’s, Conditions, and Restrictions (CC&R’s) that may be in place. Once contracted, our engineering services can provide our customers with recommendations for grading and drainage analysis, storm water treatment design, site plans, construction drawings, roadway design, construction management, water system design, and construction administration services.